Visitors and adventures at Barnards Bridge! On saturday I had a group at the house for the dog Behaviour/psychology course, so 7 new people for Betty to meet! She was in her element with so many cuddles, Annie does such a great job with her litters, they have so many visitors from day one that new people are a part of their life from the start, and being raised in the house everything domestic is easy for Betty! With so much going on all day the evening with Betty was easy, she was nicely tired out, so feet up time for me! Sunday I took Betty to meet my good friends Adam and Ian at Barnard’s Bridge, a great place to take a puppy for social experiences. Having met “the gays” (Ian’s words!) we took her into the garden for a photo shoot, Ian is a great photographer and I look forward to sharing some of the photo’s with you when Ian gets them to me! A very large Buff Orpington chicken was busy in the garden already and came over straight away to have a look at Betty, I am not sure what the hen thought she was but she wasn’t happy to see Betty and began to stalk her, Betty tried to ignore this big feathery stalker, but it was getting closer and eventually she couldn’t resist any longer and approached her, the hen is called Elizabeth :), Elizabeth was not impressed and fluffed herself up even bigger and looked like she might strike Betty, Betty ducked and made a hasty retreat to me where she got a big cuddle! What a great start for Betty to learn not to chase chickens, over the coming weeks I will take her back for another look and to reinforce this lesson. The chicken was the only thing to phase Betty, the garden she loved and explored and romped in while we drank tea and Ian continued capturing her on camera. Before leaving we made a brief visit to the other animals, Barnard’s is like the ark! Donkeys, ponies, goats, sheep and Alpaca’s. Standing at the gate with Betty held high, Ian called the animals and they came galloping down the field, sheep baaing noisily, Betty was not impressed, this was seriously scary! It is a common myth that holding a puppy at a time when they are scared will make them more scared, in fact the reverse is true, the shepherd carries the Collie puppy, often in his pocket on their early introduction to sheep. Now my guess is this was done originally for practical purposes to stop the puppy being trampled, but the outcome is that as the puppy gets to view the sheep from on high and remain safe they get braver and come to feel superior to the sheep. If carried around the sheep for too long the puppy would grow to have little respect or fear of the sheep, so timing is everything, I will show Betty the animals from my arms until I feel she is confidant, but she will go on the ground on a lead when the time is right to learn respect also. Betty was stressed by so many new experiences and this showed itself by her going sleepy, time to go home. In the car Betty fell asleep immediately, once home she bounced back to life, but I knew how much the morning had taken out of her, so having fed her it was time for a snooze, a great time to close the door on the crate, though I had the crate by me so that she could see me, Betty slept for 3 hours! The way I try to work it with my puppies is, when they have a lot of energy I look to give them a new experience, this way it makes sure I keep on target to expose them to enough life experiences so that they can cope easily with my life style. and at the same time limits the mischief they get into and therefore keeps me sane! New equals stressful equals sleep puppy, too much stress and stimulation can lead to health problems or a hyper active dog. I find if I let the puppy guide me through noticing how full of beans they are, we can keep roughly on track. Pie is funny now, on the one hand is likes Betty, yet it takes 14 days for a dog to be completely accepted into a new dog pack, so Betty has several days to go, and Pie continues to keep his distance from her, grumping when she goes after him and gets too close, he is getting more half-hearted in his reaction to her and I can see that confuses her, on several occasions now I have plucked her out of his way, especially when her adrenalin is up and she is less likely to take notice of Pie. It is vital he knows I am on his side, the pack united in teaching the newcomer the rules, this will ensure a harmonious household in the coming weeks, months, years! Toilet training is going well, more toileting outside than indoors, I don’t expect Betty to get it right all the time yet, I take her out on all the obvious times and some in between, but inevitably I miss some. Once she is a week or so older I will be shutting he in her crate more and I know that will help us both to get it right a great deal more. I have been putting a little puppy collar on and off regularly and today is the first day she hasn’t tried to scratch it off, so seems that job is done! Now I will start attaching the lead in short bursts and monitoring her dragging it around, it is a very light weight one. Out night-time pattern has stayed the same, though there is no squeaking at all when I first leave her, and in the morning just one puddle, I am delighted! 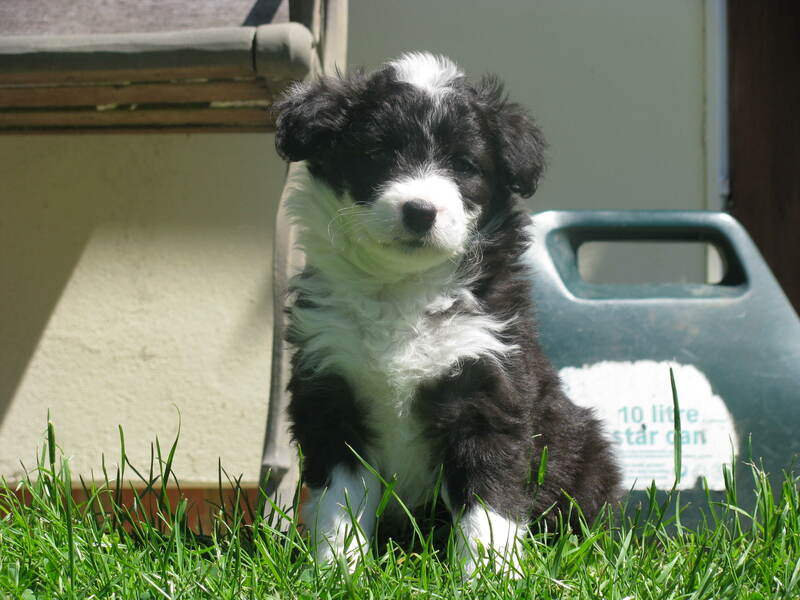 Filed in Dog training and behaviour, dogs, Puppy diary! « Day two of Betty! More visitors, Bronte visits Betty and Pie! Don’t be an Ostrich! Dogs are animals! BBC Essex Radio for a live phone in!